The earliest date at which Jews arrived in Scotland is not known. The earliest concrete historical references to Jews in Scotland are from the late 17th century. The vast majority of Scottish Jews today are Ashkenazi who mainly settled in Edinburgh, then in Glasgow in the mid 19th century. Most histories of Jews in Scotland deal with the subject from an English perspective, thus tending to marginalise any distinctly Scottish dimension. Evidence of Jews in medieval Scotland is scant. In 1180, the Bishop of Glasgow forbade churchmen to "ledge their benefices for money borrowed from Jews". This was around the time of anti-Jewish riots in England so it is possible that Jews may have arrived in Scotland as refugees, or it may refer to Jews domiciled in England from whom Scots were borrowing money. While Jews in England during the Middle Ages faced state persecution, culminating in the Edict of Expulsion of 1290 (some Jews may have fled to Scotland at this time) there was never a corresponding expulsion from Scotland, suggesting either greater religious tolerance or the simple fact that there was no Jewish presence. In his autobiographical Two Worlds: An Edinburgh Jewish Childhood the eminent Scottish-Jewish scholar David Daiches wrote that there are grounds for asserting that Scotland is the only European country with no history of the state persecution of Jews. In the Middle Ages, much of Scotland's trade was with Continental Europe, the wool of the Border abbeys being the country's main export to Flanders and the Low Countries. Scottish merchants from Aberdeen and Dundee had close trading links to Baltic ports in Poland and Lithuania. It is possible therefore that Jews may have come to Scotland to do business with their Scottish counterparts, although no direct evidence of this exists. The late-18th century author Henry Mackenzie speculated that the high incidence of biblical place names around the village of Morningside near Edinburgh might indicate that Jews had settled in the area during the Middle Ages. This belief has, however, been shown to be false, the names originating instead from the presence of a local farm named "Egypt" mentioned in historical documents from the 16th century and believed to indicate a Romani presence. The first recorded Jew in Edinburgh was one David Brown who made a successful application to reside and trade in the city in 1691. Most Jewish immigration appears to have occurred post-industrialisation, and post-1707, meaning that Jews in Scotland were subject to various anti-Jewish laws applied to Britain as a whole. Oliver Cromwell readmitted Jews to the Commonwealth of England in 1656, and would have had influence over whether they could reside north of the border. Scotland was under the jurisdiction of the Jew Bill, enacted in 1753, but repealed the next year. The first graduate from the University of Glasgow who was openly known to be Jewish was Levi Myers, in 1787. Unlike their English contemporaries, Scottish students were not required to take a religious oath. In 1795, Herman Lyon, a dentist and chiropodist, bought a burial plot in Edinburgh. Originally from Mogendorf, Germany he left there around 1764 and spent some time in Holland before arriving in London. He moved to Scotland in 1788. The presence of the plot on Calton Hill is no longer obvious today, but it is marked on the Ordnance Survey map of 1852 as "Jew's Burial vault". 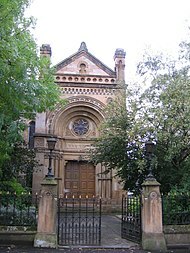 The first Jewish congregation in Edinburgh was founded in 1817, and the first in Glasgow in 1821. That of Aberdeen was founded in 1893. The Jewish cemetery in Dundee indicates that there has been a Jewish congregation in that city since the 19th century. Isaac Cohen, a hatter resident in Glasgow, was admitted a burgess of the city on 22 September 1812. The first interment on the Glasgow Necropolis was that of Joseph Levi, a quill merchant and cholera victim who was buried there on 12 September 1832. This occurred in the year before the formal opening of the burial ground, a part of it having been sold to the Jewish community beforehand for one hundred guineas. Glasgow-born Asher Asher (1837–1889) was the first Scottish Jew to enter the medical profession. He was the author of The Jewish Rite of Circumcision (1873). By 1878, Jews became attached to the Scottish aristocracy when Hannah de Rothschild, born in England, married Archibald Primrose, 5th Earl of Rosebery. She died at Dalmeny. Her son, Harry, would become Secretary of State for Scotland in 1945 during Winston Churchill's postwar Caretaker Government. In order to avoid persecution and pogroms in the Russian Empire, in the 1880s many Jews settled in the larger cities of Britain, including Scotland, most notably in Glasgow (especially the poorer part of the city, the Gorbals, alongside Irish and Italian immigrants). A smaller community existed in Edinburgh and even smaller groups in Dundee, Aberdeen, Greenock and Ayr. Russian Jews tended to come from the west of the empire, in particular Lithuania and Poland, hoping to use Scotland as a stopping post en route to North America. This explains why Glasgow was their favoured location, although those who could not earn well enough to afford the transatlantic voyage ended up settling in the city. In 1897, after the influx, the Jewish population of Glasgow was 4,000. Immigration continued into the 20th century, with over 9,000 Jews in 1901 and around 12,000 in 1911. Refugees from Nazism and the Second World War further augmented the Scottish Jewish community, which has been estimated to have reached over 20,000 in the mid-20th century. It is important to remember that the Jewish population in the United Kingdom peaked at 500,000 but has declined to almost half that number today. Some elements of the British Union of Fascists were anti-Jewish and Alexander Raven Thomson, one of its main ideologues, was a Scot. Blackshirt meetings were physically attacked in Edinburgh by communists and "Protestant Action", which believed the group to be an Italian (i.e. Roman Catholic) intrusion. In fact, William Kenefick of Dundee University has claimed that bigotry was diverted away from Jews by anti-Catholicism, particularly in Glasgow where the main ethnic chauvinist agitation was against Irish Catholics. Archibald Maule Ramsay, a Scottish Unionist MP claimed that World War II was a "Jewish war" and was the only MP in the UK interned under Defence Regulation 18B. In the Gorbals at least, both Louise Sless and Woolf Silver, recall no anti-Semitic sentiment. See also Jews escaping from Nazi Europe to Britain. According to the 2001 census, 6,448 Jews live in Scotland, most of whom are in Edinburgh (about 934), Glasgow (4,249) and to a lesser extent Dundee. Scotland's Jewish population continues to be predominantly urban. The SSPCA came into conflict with the Aberdeen congregation over slaughtering methods at the turn of the 20th century. The practising Jewish population continues to fall in Scotland, as many younger Jews either become secular, or intermarry with other faiths. Scottish Jews have also emigrated in large numbers to England, the US, Canada, Australia and New Zealand for economic reasons, as other Scots have done. In March 2008 a Jewish tartan was designed by Brian Wilton for Chabad rabbi Mendel Jacobs of Glasgow and certified by the Scottish Tartans Authority. The tartan's colors are blue, white, silver, red and gold. According to Jacobs: "The blue and white represent the colours of the Scottish and Israeli flags, with the central gold line representing the gold from the Biblical Tabernacle, the Ark of the Covenant and the many ceremonial vessels ... the silver is from the decorations that adorn the Scroll of Law and the red represents the traditional red Kiddush wine." According to the 2011 census, 5,887 Jews lived in Scotland; a decline of 8.7% from 2001. In September 2013, The Scottish Council of Jewish Communities published the "Being Jewish in Scotland" project. The project researched the situation of the Jewish people on Scotland through interviews and focus group attended by approximately 180 participants from the Jewish community in Scotland. The survey findings were that during 2011 there were 10 antisemitic incidents of abusive behavior, 9 incidents of damage and desecration to Jewish property, and one assault. Some of the participants described experiences of antisemitism in their work place, in campus and even at school. In accordance with that, on October that year a teacher in a secondary school in Scotland was facing a disciplinary hearing over claims he told a class of pupils that "Hitler was not all bad - he killed the Jews". Moreover, in 2012, the Scottish Jewish Student Chaplaincy and the Scottish Council of Jewish Communities reported a "toxic atmosphere" at Edinburgh University, in which they are forced to hide their identity. During operation Protective Edge, August 2014, the Scottish Council of Jewish Communities published a document that revealed a sudden increase in anti-Semitic incidents occurred in Scotland. According to the file, during the first week of August there were 12 antisemitic incidents - almost as many as in the whole of 2013. A few months later, a "burning" chemical was thrown on a young girl who sold Kedem (Israeli cosmetics) products in Glasgow's St Enoch Centre. On 2015 the Scottish government released the statistics on Religiously Aggravated Offending in Scotland. According to the report, there was an increase in the number of charges filed for anti-Jewish acts to 25, comparing to 9 charges a year earlier. Most of the charges dealt with "threatening and abusive behavior" and "offensive communications". Scots-Yiddish is the name given to a Jewish hybrid vernacular between Lowland Scots and Yiddish, which had a brief currency in the Lowlands in the first half of the 20th century. The Scottish literary historian David Daiches describes it in his autobiographical account of his Edinburgh Jewish childhood, Two Worlds. Daiches explores the social stratification of Edinburgh's Jewish society in the interwar period, noting what is effectively a class divide between two parts of the community, on the one hand a highly educated and well-integrated group who sought a synthesis of Orthodox Rabbinical and modern secular thinking, on the other a Yiddish-speaking group most comfortable maintaining the lifestyle of the Eastern European ghetto. The Yiddish population grew up in Scotland in the 19th century, but by the late 20th century had mostly switched to using English. The creolisation of Yiddish with Scots was therefore a phenomenon of the middle part of this period. The Glaswegian Jewish poet A. C. Jacobs also refers to his language as Scots-Yiddish. There was even a case of a Jewish immigrant who settled in the Highlands who spoke no English and was only able to speak Gaelic and Yiddish. Today, all known Jewish communities in Scotland are represented by the Scottish Council of Jewish Communities. Approximately 25% of Scotland's Jewish population reside in the suburb of Newton Mearns to the south of Glasgow. ^ a b "2011 Standard Outputs". Scotland's Census. Retrieved 23 September 2016. ^ Daiches, Salis (1929). The Jew in Scotland. Scottish Church History Society. pp. 196–209. Retrieved 25 August 2018. ^ C J Smith, Historic South Edinburgh, Edinburgh & London 1978, p.205 "At the distance of less than a mile from Edinburgh there are places with Jewish names—Canaan, the river or brook called Jordan, Egypt—a place called Transylvania, a little to the east of Egypt. There are two traditions of the way in which they got their names: one, that there was a considerable eruption of gypsies into the county of Edinburgh who got a grant of these lands, then chiefly a moor; the other, which I have heard from rather better authority, that some rich Jews happened to migrate into Scotland and got from one of the Kings (James I, I think it was said) a grant of these lands in consideration of a sum of money which they advanced him." ^ "Edinburgh Jewish History". Edinburgh Hebrew Congregation. ^ a b "Jewish history". ehcong.com. ^ "The Jewish Community of Glasgow". The Museum of the Jewish People at Beit Hatfutsot. Retrieved 25 June 2018. ^ Pigott, Robert (21 May 2008). "Jewish population on the increase". BBC News. ^ Fleischmann, Kurt. "The Gorbals and the Jews of Glasgow". European Sephardic Institute. ^ ceu@scotland.gsi.gov.uk, Scottish Government, St. Andrew's House, Regent Road, Edinburgh EH1 3DG Tel:0131 556 8400 (28 February 2005). "Analysis of Religion in the 2001 Census". scotland.gov.uk. ^ a b "Census 2011". ^ "Jewish Tartan". Scottish Tartans Authority. Retrieved 1 May 2010. ^ Schwartzapfel, Beth (17 July 2008). "Sound the Bagpipes: Scots Design Jewish Tartan". Forward. Retrieved 1 May 2010. ^ Hamilton, Tom (16 May 2008). "Rabbi creates first official Jewish tartan". Daily Record. Retrieved 1 May 2010. ^ Granat, Leah; Borowski, Ephraim; Frank, Fiona. "Being Jewish in Scotland" (PDF). The Scottish Council of Jewish Communities (scojec). Retrieved 12 January 2015. ^ "Scots teacher facing disciplinary hearing over Hitler remarks". Herald Scotland. 23 October 2013. Retrieved 12 January 2015. ^ "Jewish students warn of 'toxic' atmosphere at uni". The Scotsman. 15 December 2012. Retrieved 12 January 2015. ^ "Large Spike in Antisemitic Incidents in Scotland". The Scottish Council of Jewish Communities. Retrieved 11 January 2015. ^ "Kedem staff member doused in 'burning' chemical in hate attack". Jewish Chronicle. Retrieved 18 August 2015. ^ Davidson, Neil. "Religiously Aggravated Offending in Scotland in 2014-15" (PDF). Justice Analytical Services – The Scottish Government. Retrieved 29 June 2015. ^ "r/antisemitism - Is This Anti-Semitic? Editor of the Saint News Paper in St Andrews Scotland Joseph Cassidy says "Israel Does Not Have A Right to Exist" "Its A Stupid Idea"". reddit. ^ "Response To Common Inaccuracy: Israel Critics are Anti-Semites". Anti-Defamation League. ^ David Daiches, Two Worlds, 1956, Cannnongate edition 1987, ISBN 0-86241-148-3, p. 119f. ^ Relich, Mario. "The Strange Case of A. C. Jacobs" (PDF). Archived from the original (PDF) on 30 September 2006. ^ "Scotland's Century" (RealPlayer). BBC Radio Scotland. 1999. ^ "Feature article". Culham College Institiute. Archived from the original on 20 October 2007.